I haven’t written anything here in a while, and the reason for it is that I have been writing other things in other places. Now that I am officially on staff for www.indiegames.com, I’m writing articles for them 4-6 times a week, which involves finding and trying good games on top of the writing itself. It’s also November, which back home in the USA is National Novel Writing Month, a.k.a. NaNoWriMo. Every year, a lot of people celebrate NaNoWriMo by trying to pump out 50,000 words of a story over the course of the month. It’s doable if you keep up with it, though when I tried last year I got a few thousand words in and then stopped. This year, I picked up the same story and am trying to actually finish it. It may be a little cheaty to use the same idea and what I started with last year, but this is a story idea that’s been floating around my head for years waiting to be written. One of my Ludum Dare buddies was offering fun, $1 commissioned sketches, so I got one. 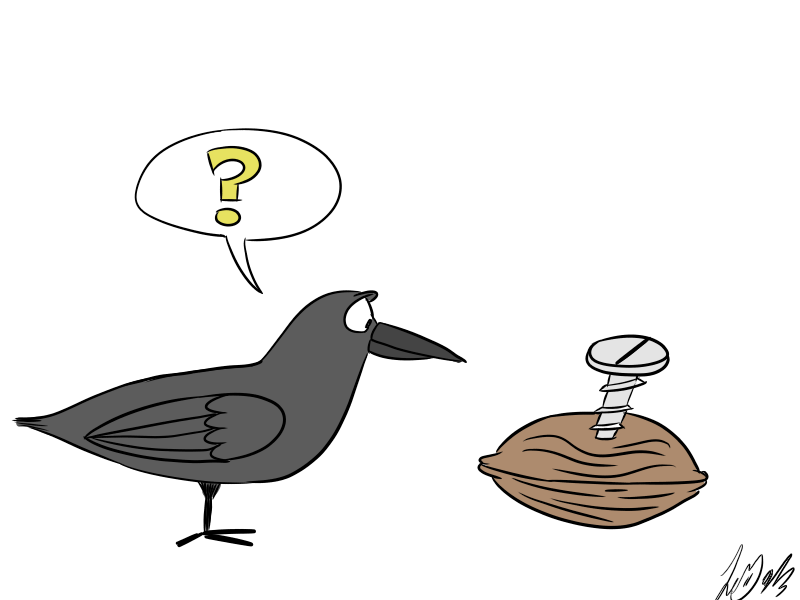 I asked him to do something with a crow, a walnut, and a bolt (as in screw, not lighting). I envisioned art involving those three things for [my old] blog back when I named it, but I am not artistically inclined and I never got around to it. I’m not going to use this as web site branding, I don’t think, but I do want it to be on here. So. Here it be. I wrote an email to Netflix, which I was unable to send them the way I’d intended. They only offer customer support through online chat and telephone and refused to give me an email address, so I pasted it into the online chat customer service. Here’s what I sent them.